This Editor, who has had many successful online purchases with Amazon ran into great disappointment with an online purchase via Amazon recently. It had to do with what do you get the wife for mother's day. You know the task, what do you get that says to you roomie that I listen to you? She is always admiring red Japanese Maple Trees. She says she wishes she had one in hr yard. You know where this going, right? 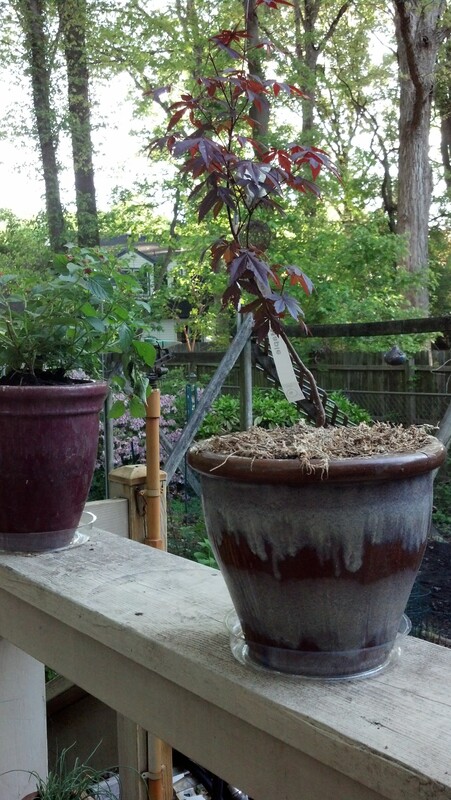 You look around, Home Depot, Lowes, and the local garden shops and you discover they are very expensive trees. But your are a modern guy, you know how to use the net for shopping and you have gotten some good deals, and hassle free purchases. You have a trusted vendor. You have Amazon. Amazon, with high standards, or so you thought. So you find a Amazon vendor that has what appears to be a good price. The Vendor has a great looking product or so they have a representative product on line. You purchase the mother's day present for the wife, in spite of its high freight. What you get is what you see at the top of this page. You don't get what you see pictured on Amazon's web page. Red leaves all season add an accent anywhere! Size shipped: 1-2 ft tall, branched in full gallon containers with soilless media and a 9 month slow release fertilizer. ATTENTION: ALL ORDERS TO CALIFORNIA ARE DELAYED UNTIL NOVEMBER DUE TO CA STATE REGULATIONS! We only ship Monday-Wednesday now through fall to avoid plants dying over the weekend. For this reason, the system may estimate your delivery time to be longer than it actually is. If you place your order Wednesday-Sunday, it will be shipped out Monday. When you receive your plants please water them immediately, as they may have traveled through hot conditions. One of the most sought after specimen trees in today's landscape is the Japanese Maple. Its beautiful summer colors and ornamental structure are what give its renowned popularity throughout the world. 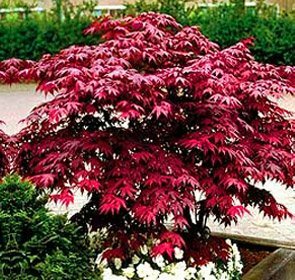 There are many different cultivars of Japanese Maples but the most common and by far the easiest to grow is the Red Japanese Maple grown from seed. These hardy trees grow much faster than their semi-dwarf and dwarf relatives, adding a centerpiece specimen to your landscape immediately. Ideally provide ample shade for the first summer. If too much shade the plant grows slowly and the red types become more green, too little and they literally cook in the summer sun at a young age. You contact the vendor and tell him about you disappointment in the product. He does tell you he is going to fix it, which is all you want to hear. Instead you get his email that says you need to take pictures and upload it to Amazon. Thus the journey begins. Rather than going through this I've elected to post what has happened here to help you from being exposed to what appears to me to be a sense of false security by buying via Amazon. To let you know you can feel disappointed, and cheated.